The 1950s Japanese film is the story of a crime committed and four widely differing witness accounts. The stories are mutually contradictory, leaving the viewer to determine who, if anyone, is telling the truth. My eight-year-old sons are keeping journals this summer, and this week they wrote about the same topic, then read their work aloud to each other and me. The differences were stark. 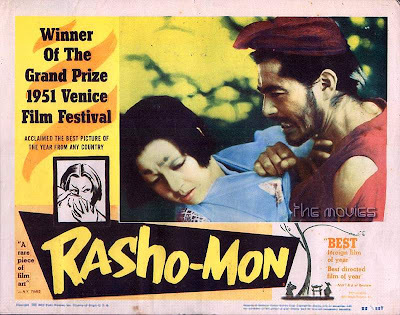 I enjoyed the stories not only for their detail and creativity, but because so much of their own personalities were exposed in the telling, and for the combined Rashomon effect. Below are the two accounts, verbatim. One day, me, my mom, and Max and Ivan were going to the library. Everything was just fine. I got books and so did Max and Mom. Ivan liked the puzzles. It was good intill the checkout. Ivan saw this thing for old people. He was screaming his head off and so mom asked us to go outside with him but Ivan didn’t. So after Mom was done she came through the detector. Suddenly BEEB BEEB the alarm went off. Meanwhile Ivan was screaming so Mom handed me her books and told me to go give them the books but it wasn’t it so she [the librarian] asked Mom to go inside to check our stuff, but Mom said no, so she [the librarian] went inside to check our basket. Soon she came back. Ivan was still screaming so we went to the side of the library to nurse Ivan but Ivan was restless. Finally he nursed and had an apple. Finally we rode home and I started righting this story and now I’m finished. Then End. “Why don’t we ride our bikes to the library” Mom said. “Sure,” me and Sam said. So we got ready. Me and Sam started going around in circals. I banged my shin twice! I said “Ow” two times. When we were at the library Iven had a tantrum so we went home. Wow, two totally different versions. I love them both!